This fusion of flavours wraps the palate in pungent aromas and vivid colours that tantalise the taste buds with trademark North Indian dishes. 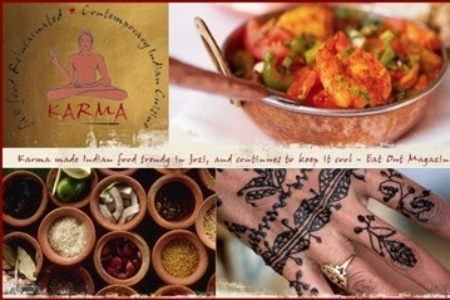 Located in the suburb of Greenside, Karma proudly carries 7 years of consecutive reputation as best Indian restaurants and is a must try. The décor speaks simplicity and elegance draped in rich browns and deep reds with tranquil Buddha statues beaconing peace to the drifting sounds of Buddha Bar music. This calming ambiance prepares the appetite for an aromatic journey of North India infused with the lingering aroma of spices and incense. 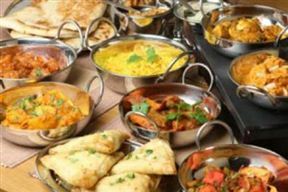 The menu includes luscious haloumi samoosas, the ever-well-liked vindaloo, paneer tikka masala, and a range of chicken and lamb tandoori dishes, mopped up with steaming rice and naan bread. House specialities include Karma Korma, fragrantly cooked and layered with juicy pieces of chicken, lamb, prawn or vegetable, cooked in a silky cashew nut and cream sauce. Wet the appetite with lingering aromas and decadent North Indian cuisine at this stylish and calming retreat – Karma in Greenside. Karma is 1km from the centre of Greenside , the nearest airport 24.3km (Johannesburg International Airport).